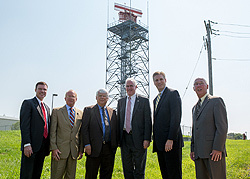 Rep. Todd Stephens, second from right, hosted a tour of the Route 611 corridor with, from left, William Walker, Horsham Township manager; W. William Whiteside, Horsham Township Council and the Horsham Land Redevelopment Authority; C Alan Walker, secretary of Department of Community and Economic Development; U.S Rep. Pat Meehan; and Mike McGee, executive director of the Horsham Land Redevelopment Authority. HARRISBURG-- Rep. Todd Stephens (R-Montgomery) announced today that the state Department of Community and Economic Development (DCED) will investigate programs to help Horsham Township revitalize the Route 611 corridor through Horsham and to reuse the former Dow Chemical property in Lower Gwynedd Township. Stephens also announced that U.S. Rep. Pat Meehan (R-7) would explore federal programs and transportation funds that could be used to revitalize these areas. Meehan serves on the House Transportation Committee. “This is a critical step forward in revitalizing an outdated roadway,” Stephens said of the 611 project. “Route 611, heading north from the turnpike, is the gateway to Horsham and relieving traffic congestion and beautifying the area is vital to drawing top-notch users to the former Naval Air Station site. “The Dow Chemical site presents a terrific opportunity given its close proximity to transportation via Route 309,” said Stephens. “I want to ensure the state officials responsible for bringing businesses and jobs to the Commonwealth know about this jewel in Lower Gwynedd Township,” he explained. 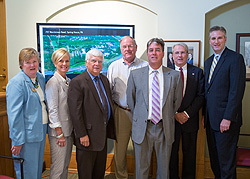 Rep. Todd Stephens, right, hosts a meeting with Rep. Kate Harper (R-Montgomery); Lower Gwynedd Township Supervisor Kathleen Hunsicker; C Alan Walker, secretary of Department of Community and Economic Development; and Lower Gwynedd Township Supervisors Dr. J. Richard Booth, Stephen Paccione, and Mark Grey. Dow recently announced it was leaving its 727 Norristown Road headquarters and taking more than 800 jobs with it. Stephens’ announcement came after he and local officials hosted C. Alan Walker, secretary of the Department of Community and Economic Development, and Meehan for an extensive tour of Horsham’s 611 corridor and the former air base. Stephens also introduced Walker to Horsham Township Council member and Horsham Land Redevelopment Authority member W. William Whiteside, who discussed the need for revitalization along Route 611, and Horsham Land Redevelopment Authority Executive Director Mike McGee, who discussed the base reuse plans and procedures. Stephens and Walker capped off the visit to the area by meeting with members of the Lower Gwynedd Township Board of Commissioners, Manager Larry Comunale and Rep. Kate Harper (R-Montgomery), who shared their concerns for finding a new tenant for the Dow site. The mission of DCED is to foster opportunities for businesses to grow and for communities to succeed and thrive in a global economy. It’s also to improve the quality of life for Pennsylvania citizens while assuring transparency and accountability in the expenditure of public funds. “These communities have so much to offer from access to transportation to a highly educated workforce – we need to be sure that businesses looking to come to Pennsylvania know about these terrific opportunities,” concluded Stephens.